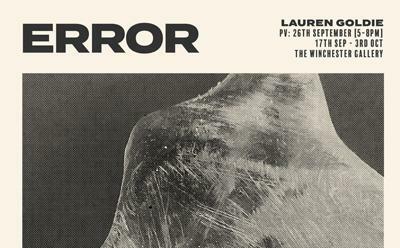 Join us at The Winchester Gallery for a returning alumna exhibition, 'ERROR' by Lauren Goldie. The show will be open Mondays to Thursdays, 10am-4pm until the 3rd October. Lauren graduated from Winchester School of Art in 2015 after studying BA Fine Art, and is now a mixed media sculptor based in London. She was announced the winner of the National Sculpture Prize in 2017 and consequently set up her studio in Bermondsey. This collection started with a test: how can light metamorphose materials? What might evolve if the materials themselves changed consistency? Wax was found to produce unpredictable projected environments, characterised by a rich dialogue between form and matter. Through drawing, Lauren began to isolate and document shapes within these environments. Then, through traditional methods of hand carving, her drawings were translated back into three dimensions. The final, sculptural products contain traces of this forced progression from ephemeral environment to permanent structure and are descriptive of the absent, evolving spaces that produced them. The show was named 'Error' in recognition of the uncertainty built in to the Artist's process. Firstly, in the unpredictable outcomes of the degrading wax sculptures and in the error of translation as transient shapes of light and shadow are given static form. Next, in human error, which causes the tight line work within her drawings to seemingly undulate of their own accord. Finally, in the transferal of these drawings into objects, which rely on hand carving, a technique involving small irreversible actions. A gradual accumulation of each process results in each sculptural outcome. Lauren's recent projects have included six months at the Cass Faculty of Art in association with Whitechapel Gallery and charitable exhibitions at various London Galleries in collaboration with Parkinson's UK.